Set in gilded age New York, These Shallow Graves follows the story of Josephine Montfort, an American aristocrat. Jo lives a life of old-money ease. Not much is expected of her other than to look good and marry well. But when her father dies due to an accidental gunshot, the gilding on Jo’s world starts to tarnish. With the help of a handsome and brash reporter, and a young medical student who moonlights in the city morgue, Jo uncovers the truth behind her father’s death and learns that if you’re going to bury the past, you’d better bury it deep (goodreads). This is the first book I've read by Jennifer Donnelly, and apparently I've been under a rock. 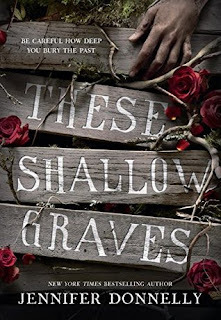 Plot: These Shallow Graves hits all of the notes you'd expect in a Young Adult historical fiction novel - young girl of the genteel class meets a boy from the wrong side of the tracks and sparks fly. The romance is nowhere near the focal point of this book, instead Donnelly explores a world where women seemly have everything, but in reality have nothing. When Jo's father seems to have been killed accidently, she does some investigating of her own and discovers a conspiracy that ups the death toll and danger. The murder mystery, while predictable, was enjoyable. It was actually a well thought-out mystery - everything was explained and I felt that I understood the motivation and danger. While I enjoyed Donnelly's engaging storytelling, what had my attention was how Donnelly highlighted the disadvantages women had from all different social classes. Her exploration and thorough research of 19th century New York is what had me eagerly flipping the pages. Characters: Jo is an inspiration. 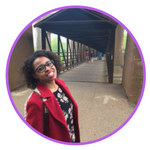 From the beginning, it is clear that she is different from her peers: she'd rather write investigative reports on New York's working class than sip tea and gossip about potential suitors. Even though her family and friends continuously explain that her world should be no bigger than the sitting room the park, Jo makes a life for herself by occasionally bribing her maid to lie about her whereabouts and wandering about the seedier parts of New York. Enter Eddie Gallagher, a young reporter from the working class. You don't need me to tell you that there is a romance, but their relationship is more of a partnership rather than a girl pining away after a boy from a different class. Let one thing be clear, Jo has got her priorities straight - she knows what she wants to do and has plans to execute it. Besides Eddie and Jo's relationship, I fell in love with Jo exploring the world around her. There is a friendship that blooms between her and another female character that is just so well done and endearing that I looked forward to their interaction over Jo's interaction with Eddie. World Building: Oh 19th century New York, you were a mess. I cannot stop gushing about the amount of research Jennifer Donnelly put into this novel; it's clear that it was a labor of love and that Jennifer took this research very seriously. Everything from the language used to explicit differences between classes is authentic and helped me lose myself in the story. Short N Sweet: I want These Shallow Graves to be taught in schools. It's representation of New York is authentic and the mystery will tug on your heart strings.